Discover high coverage with the PUPA Cover Stick Concealer; an ultra-easy concealer stick that covers imperfections and eliminates signs of fatigue. 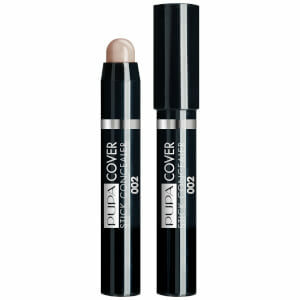 Boasting a comfortable, creamy texture, the cover stick glides over blemishes and dark circles for a smooth, high coverage finish. The product blends onto the face seamlessly and creates natural-looking results that makes skin appear flawless. Apply on imperfections, dark circles, lip contours and sides of the nose. Gently blend with your fingertips. For a greater coverage, tap it on with your fingertips. For a flawless application, use the Foundation Brush of the Professional Brushes line of products.